Surely a must for any 'Potter' fan! The wonderful special effects and amazing creatures have made this iconic series beloved to both young and old – and now, for the first time, the doors are open for everyone at the studio where it first began. You'll have the chance to go behind-the-scenes and see many things the camera never showed. 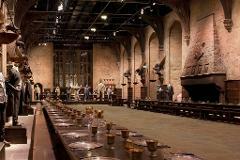 From breathtakingly detailed sets to stunning costumes, props and animatronics, Warner Bros. Studio Tour London provides a unique showcase of the extraordinary British artistry, technology and talent that went into making the most successful film series of all time. Now includes the Hogwart Express and Platform 9 3/4. Departure time - 4.00pm. ( TBC by driver on day).